What do pies and doughnuts have in common? Well, we find them delicious, but they are fattening, take up a lot of space on your plate and in your stomach, have almost no nutritional value, and their principal behavioral impact is that they leave you craving even more non-nutritious food. And there’s high correlation between excessive consumption of these tasty treats and a wide variety of unpleasant health consequences. It takes up a lot of space. It’s nearly a full page, yet provides only nine data points. It’s hard to read. Your eye must jump back and forth between the colors of the doughnut slices (or pie wedges) and the color squares in the legend. This is hard, time-consuming work. It’s hard to make comparisons. Each doughnut slice is in its own plane, at a different angle from every other slice; this makes all but the grossest comparisons difficult. There is no context. More on this below. In about one-third the space, we now have a graph that’s much easier to read. The legend presents names and points-per-game in the same order as the corresponding elements in the stack. The relative size of each graph element is easier to compare to the others, because the differences all lie along the same dimension – vertical height. 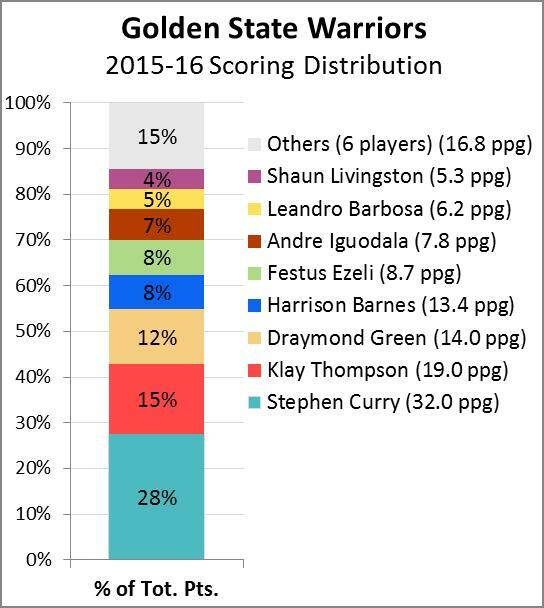 And there’s now additional information that was hard to extract from that high-carb doughnut chart; for example, it’s now easy to see from the vertical axis scale that top two players – Stephen Curry and Klay Thompson – accounted for more than 40% of the Warriors’ points, and the top three scored more than 50% of the total points. The only way to do this with doughnut charts would be to show two doughnuts side-by-side, which would (a) use up double the space and (b) be extremely difficult for visual comparisons. 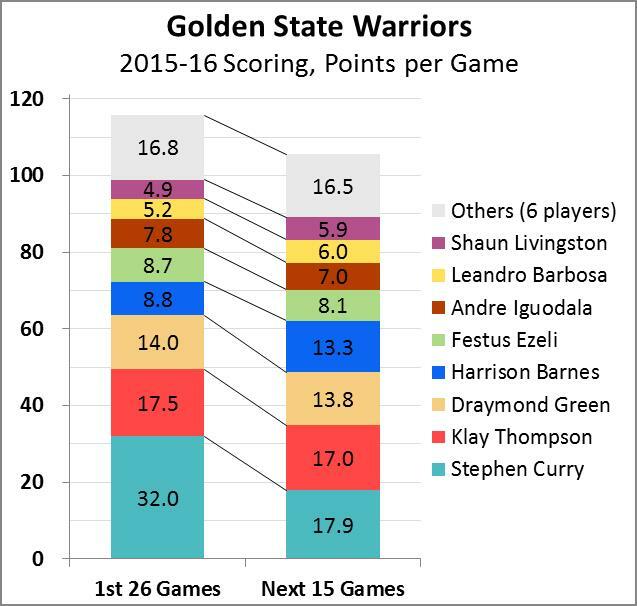 (I might add that in stacked column graphs, the series lines can be useful; here, you can easily tell whether a player’s share of the points is increasing or decreasing by whether the series lines converge (e.g., Stephen Curry) or diverge (e.g., Harrison Barnes). 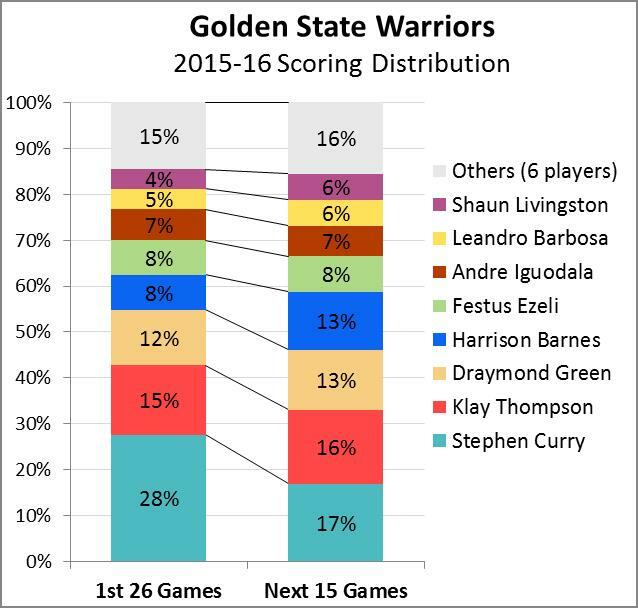 The Warriors clearly have a problem here: Stephen Curry’s average dropped by more than 14 points/game, and while the rest of the team picked up a little bit of the slack, the Warriors’ total scoring dropped from about 115 points/game to about 105. This conclusion could not have been reached with doughnut charts – not only are side-by-side charts difficult to compare for the reasons cited above, it’s even harder to make sense of the comparison when the two doughnuts are of different sizes. 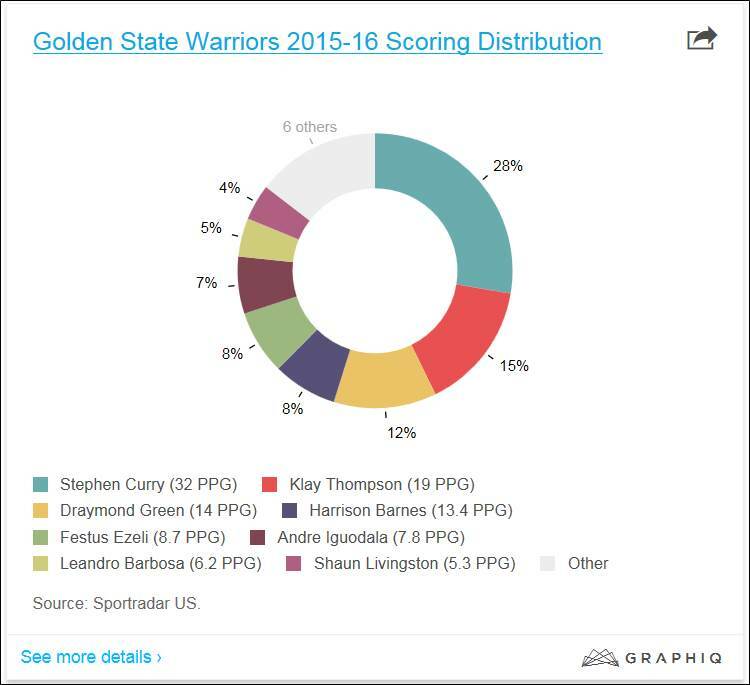 This example from basketball illustrates a few of the many ways pies and doughnuts are deficient, in quantation as well as dietetically. So the next time you’re trying to decide how to present the principal components of your company’s operating expenses, or how your industry’s market share has evolved over the years, remember that just because a graph looks tasty doesn’t mean it will provide adequate nutrition for your audience. These posts are great, thank you, extremely informative and usually funny as well.